We didn't have much of a choice, but our entire trip coincided with the "Tet" holiday, which is the equivalent to Chinese New Year. Basically, that equated to six days of celebration all over the country and many of the businesses being closed. Regardless, we were able to explore this country and experience a nice sampling of what it has to offer in terms of food, culture, history, and geography. 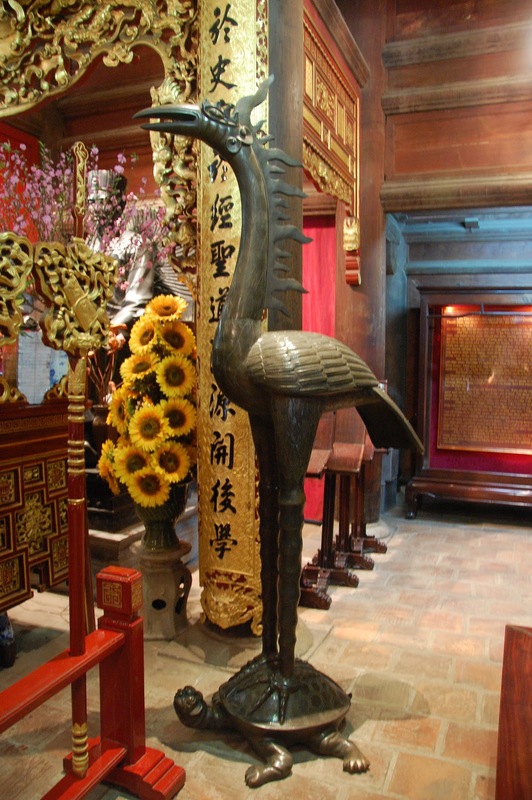 In this series of five posts, we'll highlight what we found interesting in each of the stops of our trip...........starting with Hanoi. 1. the mode of transportation of choice is the scooter in Vietnam - I have literally never seen so many scooters in my life! Traffic is absolutely overflowing with individuals and families with up to five members riding on scooters. A mandatory helmet law was recently introduced and if you've seen some of the intersections then you'd know why. This was also the first country I've been in where you have to be VERY careful as a pedestrian because even if you have the green walking man, scooters will continue to plow through. Typical intersection in Hanoi. Sometimes there are traffic lights - sometimes not, but they look the same regardless. The only rule seems to be "wear a helmet". Here we have a big intersection in Hanoi that has a bit of a European feel with the cafes and balconies overlooking the square. 2. not a place for night life - unlike most large cities, things tend to shut down after 10-11pm. We really didn't see many bars or clubs (at least in Hanoi, but probably some in Ho Chi Minh City) that were open after that. If you're coming to Hanoi to party, then plan on bringing your own. 3. 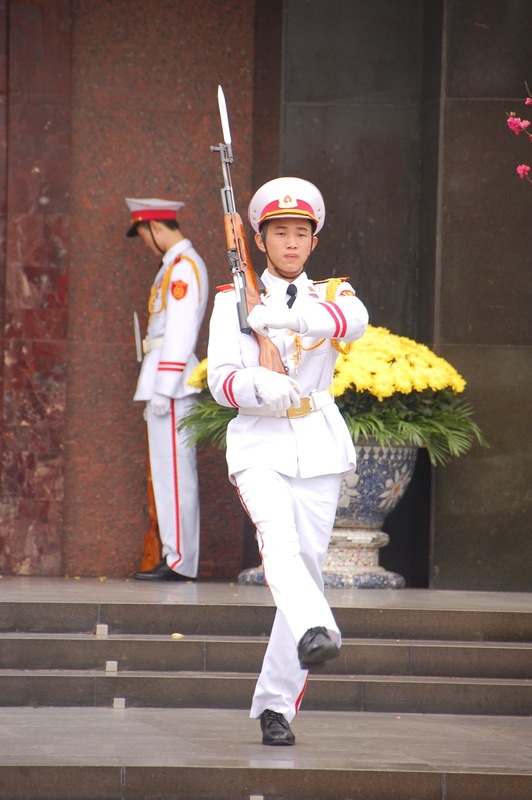 Vietnam is a socialist country -which is evident in the innumerable Vietnamese and Communist flags that decorate the streets of every city as well as the billboards featuring the common laborer/farmer standing united for the benefit of the country. Along every street you see the red and yellow colors of the communist flag, the Vietnamese flag, and these banners announcing another anniversary of the Communist Party in Vietnam. The stage is getting set for a Tet celebration at the site of a small public park featuring the Soviet-style sculptures. 4. The French definitely left an impression here - throughout Hanoi especially, one notices the narrow multilevel buildings with French influenced balconies and shutters. If that's not enough you can't help but notice the baguettes and pastries sold at local bakeries. The opera house is the most obvious relic of French colonialism, but you can see it in many other common buildings. 5. Ho Chi Minh is the national hero - although he's been dead for decades, "Uncle Ho" is the go-to character for any morale-boosting billboards and posters. Uncle Ho is laid to rest in this mausoleum, where his body is still on display - literally. They send him back to Russia for one month out of the year to get "touched up" and have kept him preserved since his death in 1969 at the age of 79. They do a ceremonial "changing of the guard" outside the mausoleum. We stopped by a few temples and pagodas - this one happens to be the Tran Quoc Pagoda, next to West Lake, where John McCain was shot down during the war. Outside the Temple of Literature there were dozens of Chinese calligraphers ready to make you their equivalent of an air-brushed t-shirt commemorating some Spring Break. Not really, I'm sure they read your palm, check your zodiac and write something fancy about your fortune in the coming afternoon. Inside the Temple of Literature, Vietnam's oldest university, there were a lot of fancy courtyards and it was nothing like a typical Western university. For example, these students are sporting the traditional school uniform. This symbol pops up all over the place here. You've got a bird with a pearl in its mouth standing on top of a turtle. I've forgotten all of the meaning except that the turtle symbolizes longevity. 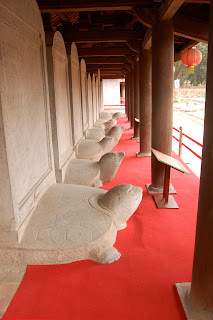 Speaking of turtles, the Temple of Literature is also known for having the records of its top students recorded on these tablets that sit on top of the turtles. They kept it up for hundreds of years, but they ran out of turtles so now they probably just put it on a website or something. One popular mode of transportation is the "cyclo" which we took on a ride through the Old Town. I really enjoyed seeing the ladies with the traditional hats, selling produce off of a woven basket. Here we have fish and vegetables. Then you've got your strawberry lady. And then some other green fruit ladies - right off the back of the bicycle. All over Vietnam, but especially in the cities you get these very local restaurants on the sidewalks with these Fisher Price table and chair sets. No, this couple hasn't been banished to the kid table.......these are adult-size! 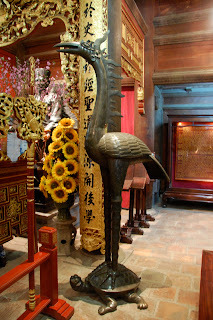 The Ngoc Son Temple sits in Hoan Kiem Lake and there's a nice legend about this lake involving a warrior leader that was magically given a sword to defend their country from invaders from the North. Afterwards he visited this lake and a huge turtle appeared. The sword then magically floated away from the warrior and right into the mouth of the turtle, who then disappeared into the lake. The allegory touches on the idea that once the invaders were gone, violence was no longer necessary to keep the peace. The Hoan Kiem Lake by night. 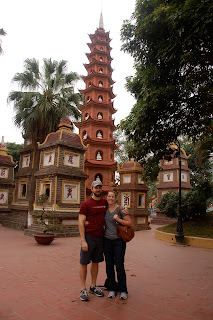 So Hanoi was how we were introduced to Vietnam and the Tet holiday. It was an interesting city bustling with scooter traffic and filled with historical and cultural gems. We would use Hanoi as a springboard to getting out to our next destination..........the natural wonder of the world that is Halong Bay.